Web developers are probably one of the most important groups of professionals we have in our world today. Depending on who you ask, a web developer is the lifeblood of the internet, slaving away in front of a monitor and keyboard, pouring their blood, sweat, and tears into the digital landscape to amuse, inform, and connect us to each other. Of course, a simpler, more mundane answer would be that they build and maintain websites. Internet is one of the fastest growing markets and is quickly integrating itself into every facet of our daily lives to the point that it is, or will soon, become inextricable from a healthy, modern society. Moreover, the internet has grown from a modest user base of under 500 million people in 2000 to well over 3 billion users by 2015. In fact, the internet has grown by 1.7 billion people in the past five years alone and projects to add another 1.1 billion users in the coming 5 years. That is why web developers have to learn a myriad set of skills in order to do their jobs. The job of a web developer is vital, not only to our personal lives but to the world economy as well. The jobs themselves involve a dizzying amount of tasks and responsibilities. Pretty impressive! 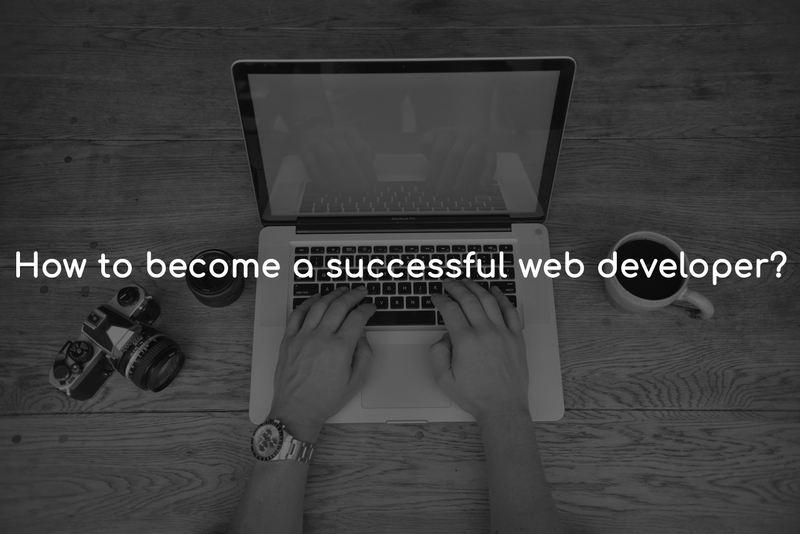 Because so many people around the world are web developers, it's important to ask, how many of them are successful. In the future, you may want to become a web developer or already struggling in this path, it's important to know how to become a successful web developer. When you're learning program or work as a developer/programmer, you must learn how to Google stuff like a pro. All of the problems you might have, you will find the solution online, but knowing where and how to find them. Whether you find your solution on GitHub or StackOverflow, you must need to learn exactly which search terms are leading you to your destination. Web developer career will be much easier when you understand how to Google for things. Most people hate their 9 - 6 jobs, but few do jobs they love and are passionate about. So, you need to find your passion. Before starting your web developer career you need to ask yourself a few questions - Would this be an exciting career for me? Do I love to experiment while to build a website or web app? If your answer is yes, then you are on the right path. When you are applying for a job as a web developer you're not asked to show your certificates, but you'll be defiantly asked to show what projects you have been part of creating already. This is why it’s really important to build up a portfolio. If your portfolio is good enough, clients and/or potential employers will come to you. To effectively market freelance services, you should ask yourself - who is my target clients? You can start by target a single industry. Once you’ve established your target market then set your rates and occasionally offer your services. Social media are very powerful tools to build your online presence, and social media is one avenue to grow it. Make sure you have a profile on LinkedIn, Twitter, Facebook, Instagram, Google+, etc. and try to promote your services frequently. If most of your works are limited for your classes, mock projects, or solo gigs, you can also increase your teamwork by getting involved in an open source project. It not only helps you to strengthen your development skills but also get your hands-on experience working on teams and projects and expand your network with other developers. Smart work is really important to become a successful web developer. You can't start every project from scratch, either you need to write generic code or use someone else modified code. It will save lots of time to complete your project. Sometimes the only thing separating you from success or failure is the willingness to continue. Successful people fail regularly, but they never give up and always find new and better ways of doing things. Follow dreams, aspirations and your purpose. What does a web developer do when they’re not coding? Clients, especially smaller ones, are beginning to expect the web developers they hire to have a range of soft skills. Soft skills are non-technical skills that will help a web developer to understand the businesses and organizations they work for better. Soft skills include advertising, marketing, accounts and many more. The soft skills you’ll need to learn will depend largely on what kinds of client you work for. For example, if a developer takes a job at a company like Amazon, then soft skills in logistics and customer experience would be hugely desirable. There are many ways to learn soft skills. If you had a job before you decided to learn how to become a developer, then you probably already have some. If you’re just starting out, then don’t worry. A lot of companies offer on-the-job training in areas that are related to their business. There is absolutely no substitute for building, shipping, and putting in the work. Build things worth paying for - find projects and problems worth solving and prove to the world (and potential employers) that you can do this. Document everything. Track what you learn and build a personal library of solutions. You need real experience. Real experience means doing work for someone else. Personal projects are useful, but they’re not enough to make you competitive in the job market. There are a few avenues for gaining real experience.